Staying healthy when you travel is a big concern of many. Falling ill when on the road is a most disheartening experience. Usually it means losing time on your precious holiday, trying to find a medical person who speaks your language, or it can turn into a serious illness and you may be a very long way from decent medical care and from the care of friends and family. Yes, I’ve had my share of illnesses when travelling, most not serious (travellers diarrhoea) and sometimes far more serious. However, to stay healthy, one needs to follow a few precautions. For example, on a seven week trip to India and Bangladesh I never fell ill once, and I achieved this by implementing the following strategy for staying healthy when you travel. This is the first item on this list for a reason. Never travel anywhere without one of these – and ensure you bring two in case one gets lost. Go on a cruise and you may see staff holding large containers of hand sanitiser offering it to passengers when they enter the restaurant. They have learnt that one of the easiest ways to assist in healthy travel is to use a hand sanitiser immediately before eating. In normal daily life the air is filled with particles that will land and stay on your hands. When at home, these don’t cause a problem because you have built a resistance to these particles. But when you are on the road, you are exposed to a whole new set of different particles – and your resistance to these is very low. I reckon that more people fall foul of water problems than any other health related issue. You need to take a cautious approach with water regardless of where you travel. Even in places with a safe water supply just the difference to your normal water can cause minor problems. Remember that contaminated water can catch the unwary as it can be found on salads and in ice-cubes. In places with very suspect water, even eating rice (that has been soaked in contaminated water) can be a problem. Drink bottled water or do as I do, carry a UV Water Purifier, mine is a SteriPEN Freedom Water Purifier that is recharged via USB. I’ve taken it into remote places such as Afghanistan and Ethiopia and it has never failed to do what it supposed to do. Also, be aware of water dispensers at different places such as airports and restaurants. This may indicate that the water is safe but it may not be true. I remember visiting a major tourist attraction that had one of those water dispensers, and it was empty. An employee removed the large and empty plastic water container from the dispenser and left the room. 10 minutes later, he returned with the same water container back filled with water. It was obvious that this was filled with tap water and not filtered water as you would expect. Also be aware of buying bottle water in certain places – ensure it is sealed before you purchase. It is not unknown for certain unscrupulous individuals to place tap water in these bottles and sell them as purified water. If the seal is broken on bottled water, don’t buy. One of the great fallacies of travel is “Never eat street food”. Experienced travellers know this to be incorrect for street food is full of flavour and cheap. So how can you tell which establishments are safe to eat? Simple – only eat at busy places frequented by locals. Any busy place with a fast turnover of food is highly unlikely to cause you problems, where quiet places with food sitting for prolonged periods waiting to be consumed is far more problematic. Thus a busy street stall is a safer option than a quiet upmarket restaurant. Furthermore, my rule is that if a lake, river or ocean is not nearby, I almost never eat fish. You also need to consider that if a place is subject to frequent power cuts, don’t chance any meats either. Of all the times I’ve suffered from travellers diarrhoea (must be dozens of times I reckon), I can attribute only one to street food – the rest all resulted from eating in a restaurant or cafe. As stated before, street food of itself should not cause you any concern, but any place that does not attract a lot of locals should cause you to think twice. One of the deadliest creatures on earth is the mosquito due to the diseases it may carry such as malaria and dengue fever to name just two. The most dangerous period is at dusk, so ensure you have DEET repellent and/or wear long clothes to avoid being bitten. In malarial areas always try to sleep under a mosquito net. If such nets are not available (this is unlikely), but a fan is, turn it on to a fast speed and create a breeze. Mosquitoes avoid such breezes and if you position the fan correctly, they will stay away from your bed. As my doctor once informed me, a bite or scratch from any animal should be treated as a serious medical situation, so if this occurs seek medical attention as quickly as possible. You name the immunisation and it’s highly likely I have taken it. There are standard inoculations that everyone should have regardless if they travel or not: Hepatitis A and B, Polio, and Tetanus. Add to this, inoculations for Typhoid and possibly Meningococcal Meningitis if travelling to suspect areas. The Rabies immunisations (a set of 3 inoculations) are a source of some contention – because even if you take them and are bitten by a rabid dog, you will still need to urgently seek medical attention anyway. It is for this reason I have never been immunised for rabies and instead I make sure I avoid domestic animals in places where rabies is found. Remember that you may require Yellow Fever if heading to large portions of Africa and South America. Some countries (and not just in Yellow Fever areas) insist on checking if you have been inoculated for Yellow Fever if you are entering or have just visited a country in a Yellow Fever area. Carry your Yellow Fever certificate with you when you travel, because if you do not, you may be forced to pay for another expensive jab. Yellow Fever now covers you for life (it was once deemed to only cover you for 10 years). In my early days of travel I used to methodically take malaria medication. However, I stopped this in 2011 due to the side-effects. Despite the years I have spent in malarial areas and without taking medication, I’ve never once succumbed to this illness. I take precautions such as: putting on mosquito repellent either on me, using an electronic mosquito repellent in a room, or wearing long sleeve shirts and long pants at dusk and at night. Note, this should not be a recommendation for you not to take malaria medication, but the side-effects were too much for me, plus when I am in a malaria country I’m always near to a hospital, so I stopped taking them. You should consult a qualified medical practitioner to discuss whether you should take such medication. Try to obtain your medication from your home country for medications may change in name and availability in different countries. It is important that you bring any vital medication with you in your carry-on baggage on a plane. If your luggage is delayed and you miss a dose, that could cause you major problems. Also, bring a medical certificate from your qualified medical practitioner (and carry an extra copy as well) in case you are questioned by authorities at customs or other places. You need a medical kit and mine contains the following: different sized bandages, antiseptic cream, paracetamol, general antibiotic, two types of anti-diarrhoea medication (one a “stopper” when problems arise, and a specific antibiotic if problems persist), sore throat gargle, small scissors, tweezers and any specific your qualified medical practitioner deems necessary. If you are feeling ill and require medical attention, I would recommend contacting your local embassy, they should be able to provide you with a list of recommended medical providers. When I caught the potentially life-threatening scrub typhus in South East Asia, I contacted the local Australian Embassy and they directed me to an excellent medical centre. Of course you should travel with insurance, and further information is provided below. 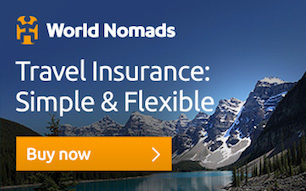 I use World Nomads travel insurance. Why? Two reasons: first they are one of the only providers that allow travellers to purchase insurance whilst already on the road without the need to return to their home country. Second, their claims procedure is very impressive. My DSLR fell out of my camera bag and was damaged, and World Nomads paid out my claim even before I paid for the repairs on the camera. This fast claims process was repeated on a later claim. If you cannot afford travel insurance you cannot afford to travel. World Nomads has my highest recommendation.